GDPR WTF and What Now?! 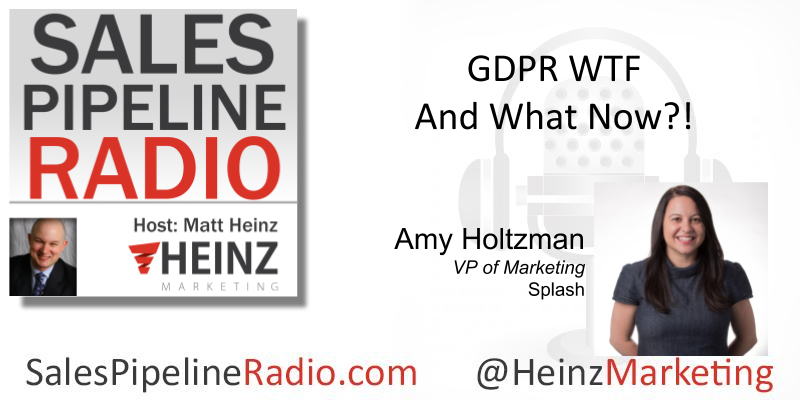 I was thrilled on this episode, "GDPR WTF And What Now?" to talk to Amy Holtzman, VP, Marketing at Splash. In recent months we worked with Splash on a webinar and a great guide on GDPR. There's a lot to know so we're continuing the conversation. Before getting into GDPR, we talk a bit about company culture and building a marketing team from scratch. Really good insights! Check out "The Uncomplicated Guide to GDPR". One of the things that was kind of fun about working with Splash on this is it that they definitely take a more casual approach. I think GDPR guides sometimes can be a little intimidating and can be very legalese. This one is different. Listen in to this episode to hear the latest and what to do next. You can read a full transcription of this episode on our blog starting Monday, 7/23/18.